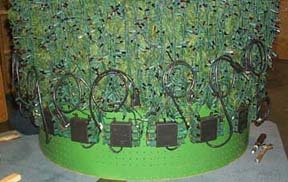 Midilite frame outputs are grouped together in blocks of 6 channels. Typically these represents the 6 different colors in a block or in some configurations may be divisions within a piece of the matrix. Special 6 channel cables and breakout boxes make installation fast and easy. Breakout Boxes provide standard A.C. ungrounded outlets for connection to your lights. Each breakout provides 6 outputs which corresponds to a block in the MidiLite frame. Each output is rated at a maximum of 600 watts. The breakouts also contain mounting "feet" for attaching to panels, walls, set, pieces, etc. 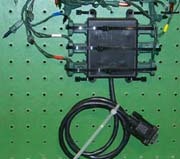 A 36" pigtail is provided for easy connection to the multi-pin MidiLite cables. MidiLite Cables are available in 25 ft. and 50 ft. lengths and can be linked together for longer lengths. Thumbscrews lock down connections securely. Once attached, Breakout Boxes can be left permanently attached to your tree panels. This provides for quick and easy connections in future years and also improves reliability by allowing the actual light plugs to remain attached. Visit our Online Store to order accessories!